Last week, we had the pleasure of hosting a webinar alongside guest speaker Moira Gregonis, Senior Marketing Manager at Urban Outfitters. During our discussion, we learned not only what inspired one of social’s most successful brands to bring user generated content onto their website, but also how leveraging fans’ images across their digital channels is impacting this multinational brand. In case you missed it, you can find 10 key takeaways from our user generated content webinar with Urban Outfitters below. To review an updated and enhanced version of our presentation, scroll to the bottom and browse the deck in full. 1. Get your fans involved. Your customers are artistic, creative, and proactive. Urban Outfitters knows this; they’re proud of this; and they’re smart about this. It’s why their marketing team makes a strong effort to bring their customers into the brand’s story, whether that means engaging with fans on social media or amplifying the images those fans take and tag by featuring them online. 2. Leverage the actions your fans are already taking. Like many brands, Urban Outfitters noticed that engagement on platforms like Facebook was dwindling. At the same time, participation by way of UGC was on the rise. By keeping a close eye on the types of images their customers were submitting, as well as the comments those photos were receiving, they were able to build a social strategy that successfully tapped into existing fan behaviors. 3. Shower your customers with love. Fans love to be recognized by their favorite brands. Showcasing their fans’ images within a dedicated online gallery is enabling Urban Outfitters to give customers the social recognition they both desire and deserve (think of it as a virtual “high five”). 4. Spark user image submissions. Since launching their online gallery of fan images (using Curalate’s Fanreel solution), Urban Outfitters has seen nearly a 95% lift in engagement with photos that contain the hashtag #urbanoutfitters. Moreover, UGC submissions have surged; Urban receives as many as 900 fan photos a week! 5. Revamp your ratings & reviews. Today’s consumer doesn’t have the patience to read or write traditional text-based reviews. Taking a picture and adding a caption, on the other hand, makes sense in this fast-paced world. With Curalate’s Fanreel, Urban Outfitters is now able to capture reviews visually and bring them back on site, where they can be displayed publicly next to the products they represent. 6. Provide social proof that sells. UGC is simple and effective. As Urban Outfitters discovered, real people taking pictures of your products in the real world can be even more impactful than a traditional ad campaign, driving a significant increase in conversions, time-on-site, and click-throughs to product pages. 7. All hail the “Shop It” button. 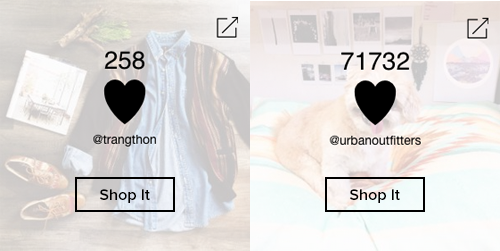 Adding a “Shop It” button to fans’ photos changed Urban Outfitters’ business in a major way, creating a new, clean channel of revenue with which to prove social ROI . UGC is now a powerful vehicle for sales for the brand. Urban’s stores and fans span the country. To market to different regions, the brand maintains separate Instagram handles to communicate localized style inspiration to fans east and west, north and south. That way, they’re not talking bikinis to New Yorkers in December or puffy coats to Floridians – ever. On their website, this visual dialogue comes together in a singular, cohesive conversation led by the fans who love Urban’s style, no matter what city they call home. 9. Support individual business pillars. In addition to distinct communities, Urban Outfitters has separate lines of products, and each one attracts a slightly different type of client. To support popular pillars of commerce, they’ve created three individual streams of user-generated images: one for home goods, one for music, and one for their coveted collection of clothing. By doing so, they can provide a custom experience that speaks to fans’ individual interests. 10. A dynamic tool for agile brands. UGC thrives on your .com, but it doesn’t end there. 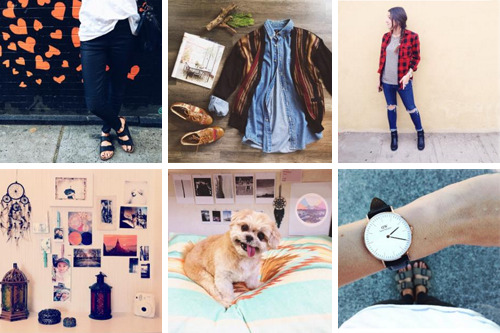 The best social strategies are also flexible – something that Urban Outfitters knows and applies. A few tips for brands looking to augment their social strategy: Consider promoting hashtags in store to generate more UGC, and continually scan the industry for innovative tools such as our new Like2Buy solution, which enable brands to monetize the other side of the visual coin – the inspirational images you take. Bringing User Generated Content into the Ecommerce Experience – Curalate Partner Webinar Series from Curalate.